I will start any video games. They are almost always in fullscreen or windowed fullscreen. Mostly later because I can alt+tab and look up meta-game info when necessary. Ever since the windows 10 update like 3 or 4 weeks ago. I don't remember exactly when. The problem started and there seem to be no sure fire way to fix this. Restart might resolve the issue for a little while before coming back. Alt+tab just move the window down and right as expect then back to the same issue again. I can't be 100% sure where the cause is. But I strongly suspect it has to do with my old PC and how it interact with windows 10/current nvidia driver. 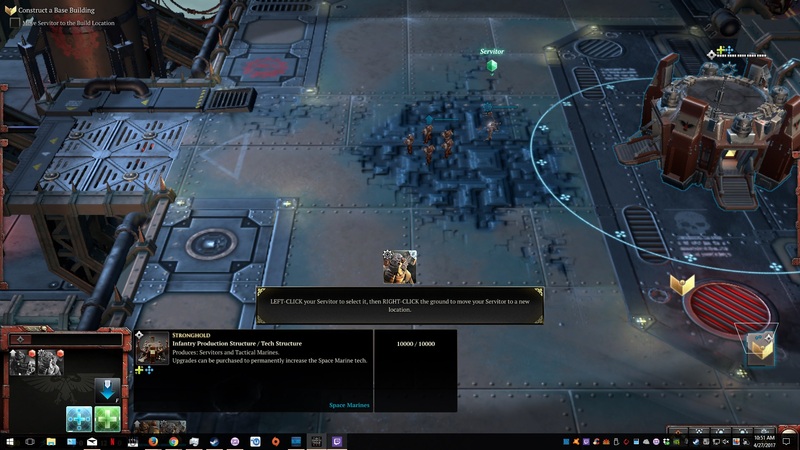 Here is an example screenshot from Dawn of War 3. IGNORE the low quality graphic I was just testing the tutorial and see if it runs at all. That said there are plenty of games that will not suffer from it at all while other do. My setup is black 1075t amd cpu. Nvidia 660 GTX. First one is to tap twice Win button on keyboard. It would call and then hide Start menu, which at same time would hide task bar. Second one is to have other application window open on same monitor and use alt-tab to swap to it and back to full screen application. P.S. Surprisingly non of above worked for me right now, but it still can be useful. Go to taskbar settings and change the taskbar position. It instantly fixes it, and you can even put it back down if you want. Some people claim that unpinning all the taskbar icons and then pinning them back fixes the issue. Right cliock on the desired app, click properties. Go to compatibilty tab. check Disable full screen optimization. this worked for me for an app,the app still runs in full screen. Not the answer you're looking for? Browse other questions tagged pc windows-10 or ask your own question. How can I keep my saved Skyrim game off other Windows user accounts?